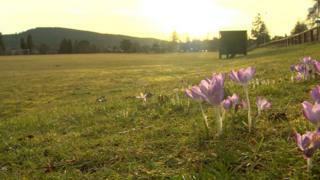 Aboyne has broken Scotland's February temperature record which had stood for more than 120 years. The highest temperature previously recorded for the month in Scotland was 17.9C in Aberdeen on 22 February 1897. However, Aboyne in Aberdeenshire reached 18.3C on Thursday afternoon. The Moray coast was also basking in warm weather, with Lossiemouth and Kinloss among the towns hot on the heels of Aboyne in the temperature stakes. Weather experts said the north east corner of Scotland's temperatures were experiencing a boost from what is known as the Foehn effect. It involves air warming as it moves up and over mountains. It said the current record maximum temperature measured in the UK in February is 19.7C, which was set in London on 13 February 1998. The Welsh record temperature for February was set at 18.6C in Powys in 1990 and the highest in Northern Ireland was 17.8C in Bryansford in 1998. A large area of high pressure centred over continental Europe is predicted to move across the UK, bringing settled, dry and sunny weather to much of the UK. The mild conditions are expected to continue into next week.